During the second world war, Hayling Island was an important Military base which played a very important role in the defence of the Portsmouth area and to the build up and execution of the D-Day landings. The population of the Island increased from 3000 to about 9000 with the arrival of military units supporting the war effort. Accommodation for the military was mainly by the requisitioning of Holiday Camps with all the facilities needed to house large numbers of personnel with little need for changes. On September 1, 1939, 48 hours before the official outbreak of war, The Minister of Transport made an Order taking control of the undertakings of the ‘big four’ and the London Transport Passenger Board (Transport for London today) plus any ‘Joint Committee’ of two or more companies plus some smaller ancillary railways who had not been amalgamated in 1923. The Hayling Island branch line was amalgamated with Southern Railways in 1923 and now, like all other railways, was run by the Railway Executive Committee (REC). With the tripling of the Island population and the high demand for the movement of people, goods and equipment, the Hayling branch line was stretched like never before. Like all railways in the UK, it met the demands but suffered from lack of investment. Two major threats were prepared for; Air attacks and Invasion of the land. With Portsmouth Naval base being close by, these sensitivities were heightened. In mid 1939 heavy anti-aircraft gun emplacements were being deployed. More information about air defences. More information about land based invasion defences. With the enemy bombing of UK cities (particularly Coventry) in 1940, measures to safeguard large built up areas were investigated resulting in the deployment of decoy sites. It was hoped that the bombs would be dropped on the decoy site rather than the intended target. The Langstone Harbour decoy site was the most successful site in the war . More information about the Langstone Harbour Q Decoy Site. In 1943/44, four Phoenix sections for the Mulberry Harbours were built near the Portsmouth – Hayling ferry. These were to be used to form part of the breakwater for the Harbours. Other sections of this type and others were built elsewhere, all of which were towed across the channel and linked together to form the harbours. 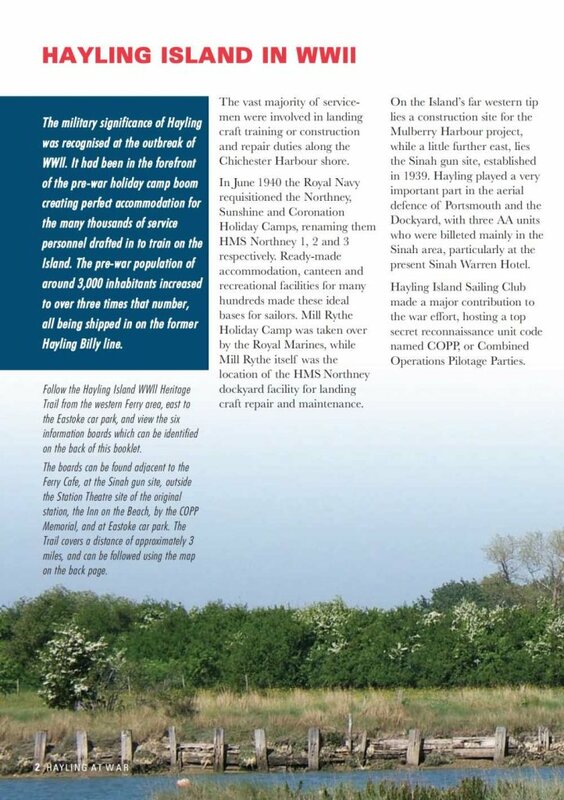 More information about the Mulberry Harbours.